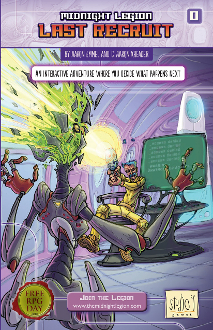 Midnight Legion: Last Recruit is a complete 24page solo adventure booklet which was part of the 2018 Free RPG day. If you missed it at your local gaming store, you can get a print copy here! It is also a prequel to the Midnight Legion gamebook series that leads you through the adventure of training a new Midnight Legion agent. The character you create here can be used throughout all three books. All you need to start is this booklet and a pencil. Midnight Legion lets you decide what will happen next. You must survive using combat, stealth, or sixth sense and diplomacy. Solve puzzles to unlock secrets about your mission—and, more importantly, your own identity. Whatever you decide, your actions change the world around you and determine the encounters you face next. Every game you play is different, and you’re going to need all your skills to prevail.